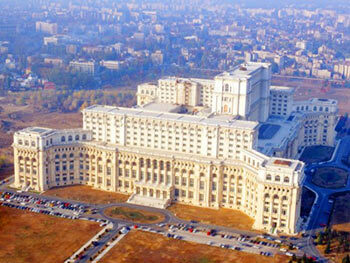 Bucharest is the capital of Romania with a total population of 2.3 million. It is situated at about half distance between the Black Sea and the Carpathian Mountains and near the Danube river, in a temperate - continental climate (-3 degree in January and 25 degree in July). Bucharest is the city of many parks and gardens, surrounded by lakes and forests. During the 1930's its tree-lined boulevards and architecture gave it the nickname 'Little Paris'. Also is famous for its very intensive night life. Romanian people is a latin one and the romanians love to live. Otopeni Airport is 18km north distance from Bucharest. Romania has to few airports, so for further transportation you will have to use the train, personal car or intercity public car services. Inside the city, one can use taxies or the regular bus for 0.65� ticket, every 30 minutes routes, definitely over crowed and never on time to lead to the right destination. Gara de Nord, the main Bucharest's railway station is close to the subway so the access toward the city is extremely easy. Situated in the central part of our country, on the middle way of the Olt River, the Brasov county is in fact the land of tourism. It's easier to speak about the places without a tourist interest than to mention the numberless points where eye and heart are fascinated by the wonderful landscapes. The origins of Brasov as medieval town are lost in the dark times. The buildings of Brasov can tell you a lot about the evolution of the city throughout different ages. Also known as Kronstadt or Corona, Brasov was the home of some of the best craftsmen, jewelers, and traders living in Transylvania. Thanks to its natural landscape as well as to its place in a central region of tourist interest, the Brasov county is on the first place in the Romanian tourism. From here many other tourist zones begin like the spokes of wheel; the Prahova Valley with its famous Sinaia, Azuga Busteni Spas, the Bran Rucar Pass; the Olt Valley and the mountain and hilly zones of the Covasna county. This is the ideal region where the pleasure tourism, short holidays, climbing or different sports can be done. Starting Brasov, Poiana Brasov, Predeal, Bran, Zarnesti, Rasnov, Vama Buzaului or the town of Victoria, the mountain can be reached on the first step to tens kilometers. From here, on railway or roads all points of tourist interest can be reached in half of a day at the most. 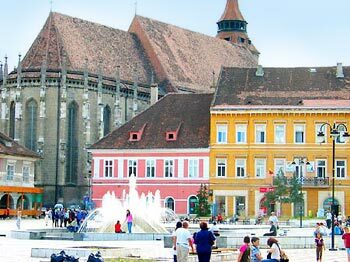 The Brasov county has to be also mentioned for its numberless historical, architectural, cultural and art monuments. Places of interest in the city include remnants of a citadel built in 1553, a 14th-century Gothic church, the 13th-century Church of Saint Bartholomew, and the town hall (1420). Two cultural centers are the Brasov Regional Library, which has collections of ancient Romanian manuscripts, and a historical museum housed in the 15th-century building of the first Romanian school. The Transylvania University of Brasov (founded in 1971) is also here. The Black Church is the largest construction in Gothic style in Romania, built between 1384-1477, with 89 m length and 38 m wide; its name (Black Church) comes from the great fire in 1689 that caused serious damages and turned its walls black; it is remarkable for its Renaissance and Baroque elements, a great number of statues and one of the oldest organ (with 4000 tubes on 75 registers) in our country. A fantastic and very valuable collection of old oriental rugs / carpets (16th - 17th Century) is displayed inside the church. If you want to remember Brasov as beautiful as it is, you can take the tele-cabin up to Panoramic restaurant which is on the top of Tampa mountain. The city lies at your feet and that will make you feel like beeing on top of the world.